This is the third and completely revised edition of a now classic handbook that focuses specifically on management challenges faced by research scientists and technical professionals. In Lab Dynamics, Carl and Suzanne Cohen draw on their unparalleled professional experience (Carl as a scientist and Suzanne as a psychologist) and as workshop directors to provide invaluable, practical advice on how to succeed in science for working scientists and those in or preparing for management or leadership roles. The book is also required reading for anyone with an administrative role in the research enterprise who must understand that world and its complexities. For this third edition, two new chapters have been added. The new Chapter 4, on hiring scientists, provides a data-driven approach along with step-by-step guidance and editable and downloadable forms for use in evaluating and ranking applicants. The new Chapter 6 gives a guide to keeping scientists focused and motivated through appropriate feedback. Scientists at all levels want and need to hear how theyre doing from mentors, managers, or leaders. All other chapters have additional sections, many based on case studies and examples shared with the authors by working scientists. They include Ten essential characteristics of scientific team leaders with specific examples of each behavior and its impact. Government organizations, academic institutions, and funders are increasingly focused on the management of science and the improvement of the scientific enterprise. With this update, Lab Dynamics is a resource like no other for those who lead and strive to succeed in a scientific setting. 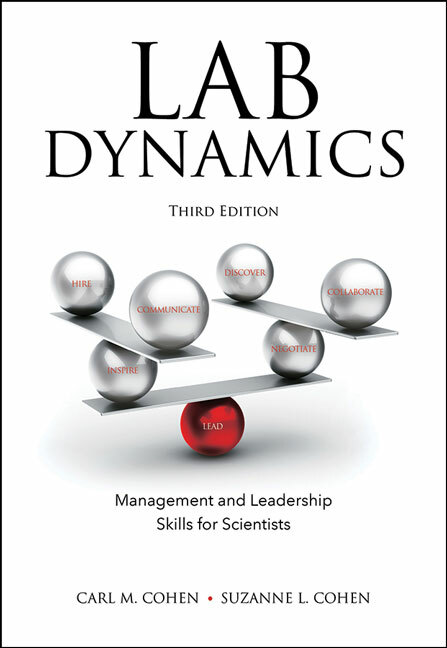 Praise for the first edition "Lab Dynamics is a highly understandable and practical bookâ€¦Experienced leaders will find it a practical refresher in mastering their skills, whereas non-management and earlyâ€“career professionals will find it much more than a survival handbook." "... (provides) a comprehensive skill set for surviving other scientists and the pressures of the work place. Scientists who work in settings ranging from industry, government, or academia will likely find the book interesting and useful." Some of the most important decisions we make involve selecting and hiring the members of our team. Yet despite the fact that our research success depends on the choices we make, most of us go about this process in an ad hoc manner, relying on "intuition" and "gut" feelings more than on data. How to recognize and avoid cognitive biases in candidate selection. How to assess a candidateâ€™s all-important "personal characteristics," such as their ability to hear and use feedback, to navigate setbacks and adversity, and to manage disagreements and conflict. How to conduct candidate phone screens and face-to-face interviews and how to â€˜listen between the lines' during interviews and phone calls with candidate references. How to set meaningful goals for scientists. How to provide feedback, performance reviews and advice that scientists can hear and use. How to use easy to remember scripts and flow charts to help you navigate your way through difficult feedback conversations. How to use Individual Development Plans as a productivity-enhancing tool. Culture. Defines the meaning of lab culture and shows how you can create a culture that promotes productivity. Delegation. A guide to getting comfortable with delegating responsibilities and tasks to your team members. Psychological safety. Shows how to promote idea sharing and risk taking in your science team to enhance performance. An expanded discussion on how trainees can get what they need from a passive or absent mentor. "Ten essential characteristics of scientific team leaders." Describes the ten essential behaviors exhibited by effective scientific leaders, with specific examples of each behavior and its impact. Other chapters: New case studies and examples taken from stories shared by working scientists have been added. 7 Team Meetings: Whos in Charge Here?